Giveaway: L.A. County Fair family fun pack! The L.A. County Fair is rolling out its signature Ferris Wheel on Sept. 5, and more than the usual suspects will be there. Under the Sea will invite kids to explore a shark cage, a kelp forest and a science discovery lab. Alex the Alligator will be among the hosts of Jurassic Planet, an exhibit that includes a T-Rex Learning Camp and fossil exploration. Water-spraying elephants will greet visitors at Gateway to Africa. Kids will learn about the pachyderms, as well as giraffes and the flora and fauna that are native to the continent. Best of all, I'm giving away a family four-pack of tickets plus a reusable L.A. County Fair bag. 1. 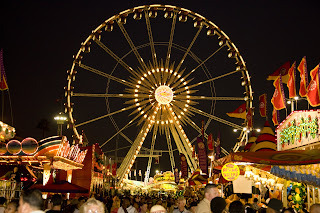 Leave me a comment on this post telling me your favorite fair food. 2. Follow me on Twitter (I'm @la_story) and send me a message/direct message letting me know your favorite fair food. 3. Leave me a comment on this post AND follow me/send me a message via Twitter letting me know if you like cotton candy or funnel cakes (or anything else), and I'll enter your name TWICE! I'll announce a winner Friday, Sept. 4. Ian and CC are in Florida visiting family, and I'm here in L.A.
We've been talking multiple times a day, which is great, but it's definitely not the same. L.A. is not the same. Mickey, Minnie and friends are making their way to the Nokia Theatre downtown next month to headline Disney Live! Rockin' Road Show. And you can bet CC will want to hitch a ride on that one. The new show, which features music and dancing, will kick off its tour through the Southland on Sept. 20 in Long Beach. Donald and Daisy will hit the Nokia stage in Los Angeles Saturday, Sept. 26, and Sunday, Sept. 27. CC enjoyed the circus so much, I'd love to take her to another live show -- especially one where her shouts and screams won't be greeted with stern looks and possibly security. Listed below is the full performance schedule. And L.A. Story readers can receive a $3 discount on each ticket by typing the word "LIVE" in the promotional code box at checkout. 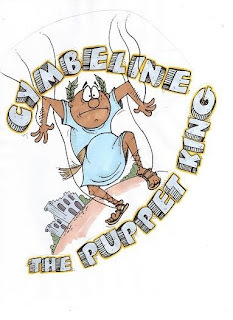 This weekend marks the final performances of The Actors' Gang's free, family-friendly production of "Cymbeline the Puppet King," based on Shakespeare's play "Cymbeline." The troupe's fourth annual Summer in the Park production is created specifically for kids and transforms the Elizabethan drama into something a little more fun, musical and merry for the pint-sized set. How Angela Berliner (who adapted the play) and director Will Pelligrini have done that is a mystery to me, but I'm assuming thwarted love, poison and attempted murder aren't part of the playbill. Performances will take place Saturday and Sunday (Aug. 29 and 30) at 11 a.m. outdoors in Culver City's Media Park (next to the Gang's HQ). The play is under 1 hour. Admission is free, with no reservations required. As kids head back to desks, pencils and playgrounds, I thought I'd share some fun back-to-school activities from our friends in Wuzzleburg. 9. Eat when cooled or pack in lunches! 6. 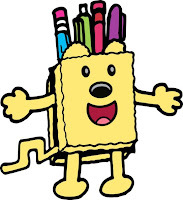 Insert pens, pencils or markers in the opening to create wacky hair for Wubbzy! Earlier this week I posted here and on L.A. Moms Blog about CC's new fear of the dark. Kimberley Clayton Blaine from TheGoToMom.com -- who's also an L.A. Moms Blog contributor -- posted the above video about childhood fears, including that pesky one that only shows up at night. It was nice hearing that this phase is right on target for development. She advocates support and empowerment when dealing with these fears. And, she says, parents shouldn't make their child feel silly because of them. And speaking of empowerment, Vanessa over at Chefdruck Musings -- who contributes to New Jersey Moms Blog -- suggested this rechargeable ladybug flashlight from Sylvania. When it sits in its stand, the flashlight also acts as a nightlight. What a great way for a child to feel she's in control -- especially since nighttime isn't going away anytime soon. 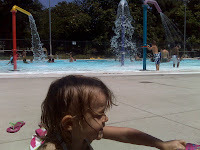 This post might be completely inappropriate, but sometimes you have to take risks as a blogger -- even as a mom blogger. And believe me, there are lots of moms out there who reveal a *lot* more than I do to the world. Hello, Motherhood Uncensored! Big love to you! This is the video I alluded to in an earlier post about our trip to Las Vegas. CC found a shopping bag full of brand-new underwear and decided to don a pair on her head. Gives new meaning to the whole Mad Hatter idea for sure. It's a mad, mad, mad, mad tea party! Yesterday, CC and I hopped down a Grove-bound rabbit hole and ended up at the Mad Hatter's Tea Party, hosted by the Fowler Museum at UCLA as part of the outdoor mall's Tuesday Summer Session. 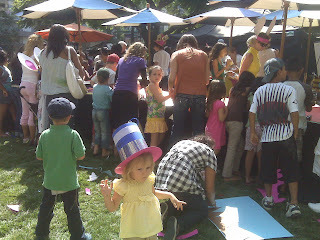 Kids and their parents gathered around tables set up in the park area of the Grove, while volunteers from the museum provided construction paper, pipe cleaners and crepe ribbons for a hat-making extravaganza. 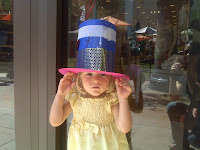 We opted to riff on the stovepipe, with CC taping, coloring and modeling her "mad" pink and blue creation. We had barely gotten everything stapled and in place before she made a beeline for the Gap, where she ran upstairs to the kids' area, grabbed some stuffed animals, chairs, plastic plates, forks and spoons and assembled her own pint-sized gathering. "Whatcha doin', Sweetheart?" I asked. CC barely acknowledged me, she was so focused on her various tasks. I was stunned by her familiarity with the store. It's as if she lived there in her spare time. "My tea party," CC finally answered while still wearing her Mad Hatter's hat. How cute, I thought. And then I wondered: Those monkeys and ducks are taking up a whole lotta room here. Am I even invited to this thing? Next week is the final week of the Grove's Summer Session, the program that has invited L.A. museums (including the Fowler) to stop by and provide some hands-on entertainment for kids. The Grammy Museum will cap off the series by offering live musical entertainment Tues., August 25 from 2-4 p.m. If you can't wait that long, musician Michelle Branch will be performing a free concert at the Grove tonight at 8 p.m. While driving through Griffith Park last week in search of the famous Travel Town Museum, CC and I found ourselves in another nook of the sprawling landscape. We didn't track down the choo-choos we were looking for, but what we did find was pretty amazing. CC spied the playground first, and I spotted the sign for the neighboring Merry-Go-Round. Forget trains, folks. Once the kid spots a slide and some swings, it's all over. The play area, called Shane's Inspiration, is a "Universally Accessible Playground." What that means is that the equipment is accessible to kids with disabilities, including those who are wheelchair-bound. There are ramps, a box-like train that kids can walk -- or wheel -- right into without having to climb any stairs, as well as full-chair swings. But there are also steps and slides, all situated on a bouncy turf instead of rough concrete. Great for those inevitable spills that CC knows so well. Next, we walked over to the park's Merry-Go-Round, which was built in 1926 and brought to Griffith Park in 1937. There are 68 carved horses and a couple of sleighs. We opted for the sleigh, as we spun around and listened to the piped tunes of the band organ. CC couldn't stop smiling and peering over the top of the sleigh -- making sure the horses were on their best behavior, no doubt. It was like stepping into a time machine. The dark brown wood of the bobbing horses was faded and worn in familiar places. I imagined kids from generation upon generation using the same places to secure their hands and feet while climbing into the saddle. The lights, the paint and the accompanying music reminded me of so many old Hollywood movies. There was even a sign saying that Walt Disney got the inspiration to build Disneyland while watching his daughter ride one of the horses. We'll have to check out the trains next time. But that afternoon, we did OK without them. Check out my latest LA Moms Blog post: "Since when is my child afraid of anything, especially the dark?" This is a relatively recent development ... and it's a complete 180 from her normally fearless personality. One of the saddest things I've seen happened last week, when I was working on the computer after her bedtime. CC came into the living room, grabbed a photo of Ian and I at our wedding, placed it on the couch and fell asleep next to it. This weekend, we hit the 48th annual Sunland-Tujunga Watermelon Festival, and we almost missed the free watermelon altogether. We got a little distracted by all the rides (a Ferris wheel included! ), the games, food and teens singing Killers songs on stage. Not to mention the heat. Wow, was it hot! Our first stop was a gelato kiosk that sold all sorts of fruity-flavored goodness. We -- meaning I -- chose sour apple over watermelon, because I didn't want to OW (over-watermelon) right from the start. Little did I know it would take us a while to actually find the headliner fruit itself. We moved on to a little catch-the-duck game, where CC won a stuffed green lizard (left). Yay first try! Next, we visited a huge spinning bear ride, where the three of us climbed inside its ursine belly and spun a huge wheel to intentionally make ourselves dizzy. We looked a little insane when we finally got out -- as if we had spent a little too much time in the festival Beer Garden -- but CC was a big fan (below). And who can argue with a 2-year-old when it comes to carnival rides? Finally we found the main fruit attraction and, I'm sure, devoured a whole watermelon by the end of our visit. I like it well enough, but Ian and CC couldn't get enough. You'd think I'd get photos of that. You know, my child dripping with watermelon at a watermelon festival. The fruit still remains elusive. That library song and dance? Love it! Never underestimate your local library. While CC was playing at the smaller tykes' playground at Pan Pacific Park on Monday, one of the moms told us we could catch storytime at the neighboring Fairfax Branch Library. Not only would there be books and storytelling, there would also be singing -- a CC must-do. So we packed up our things and walked over with a few other moms and tots to catch what turned out to be the second-to-last day of Baby Summer Club, which concludes Monday, Aug. 17 at 4 p.m. 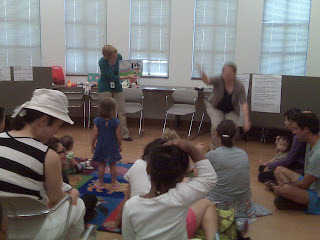 Please excuse the horrible, grainy pic I took on my BlackBerry, above, but you can see the librarians were really into entertaining the kids. They sang "Old MacDonald," "The Wheels on the Bus" and "If You're Happy and You Know It," all of which delighted CC and brought her to her feet. Yeah, that's her up front. She was too excited to just sit, and luckily the other kids joined in, too. While I was disappointed to learn we had missed so many Baby Summer Club meetings, it turns out the library is hosting Monday Morning Storytime, beginning Sept. 14 at 11:30 a.m.
We'll definitely be checking that out! CC took her first step to becoming a movie maven on Sunday by setting foot on the Paramount Pictures lot -- this time for the 24th annual Children's Festival of the Arts. The festival, sponsored by the Hollywood Arts Council, was a playground of arts and crafts that included face painting, puppet making as well as drawing, painting and bookmark crafting. And don't forget the performers. CC rekindled her love of Japanese taiko drums. (She got her first taste at the Getty earlier this year.) She also saw Mally Lewis (daughter of Shari) and her puppet Lamb Chop perform on stage. The event was crowded with kiddos, but CC found an empty chair at the bookmark table, where she fashioned a monkey-heavy red bookmark as well as a green tropical-themed one, all while mastering the art of the glue stick and foam stickers. Next, we hit the painting table, where she experimented with even more color. Once she was outfitted with orange construction paper, CC didn't hesitate to dip her paintbrushes into blues, oranges, whites, pinks and yellows. There was even glitter, which is yet another form of baby crack. She painted and poured and painted some more, even sharing with the kids next to her -- a huge feat at this age. On our way out, we caught a glimpse of Mally Lewis and Lamb Chop singing tunes from "Hairspray" on stage. When Mally's throat went dry, she asked for water and quipped to the audience: "The thing is, when I choke, I choke for two." Our final stop was another visit to the taiko drums. Luckily for CC, they were now on display instead of on stage being used by those pesky performers. This time, she could take a whack at them herself. And she still remembers it. Every day since Sunday, CC's been saying over and over, "I drumming, Mommy! I drumming!" It must have been the dauntingly tall image of a man standing just to the side of a desert road that grabbed our attention on our drive back from Las Vegas to L.A.
At first Ian and I weren't sure what we were looking at, but we pulled off of Interstate 15 anyway once we saw the exit for Calico Ghost Town in Yermo, Calif. Maybe you wouldn't have done that. I don't blame you. And, of course we were listening to the nostalgic sounds of old '50s tunes. That, coupled with driving through the vast, parched desert, seemed like the obvious opener to a really scary horror movie. Having a trusting toddler in the back seat only contributed to our sense of dread. We drove the three miles from the Interstate along Ghost Town Road, wondering if we'd done something really insane. I mean, this would be the perfect place to have a flat. And all the homes with "For Sale" signs out front didn't make us feel any better. Once we reached Calico, nestled into the side of King Mountain, we drove past the empty(!) admission booth and proceeded to the parking lot. It was there that we saw the buildings of a former mining community ... and all the tourists who apparently had the same idea. Yeah, it's not so scary once you get inside. According to Calico's Web site: "Calico was developed in 1881 during the largest silver strike in California. Located at the side of towering King Mountain, the town was named for the variety of colors in the mountain that were 'as purty as a gal's calico skirt.' Calico boomed during 1881-1896; but the end came to the silver rush in 1896 and by 1904 Calico had become a ghost town." Also, only 1/3 of the original buildings still stand, and the others have been reconstructed in the same style. CC loved running up Main Street and investigating the various (working) shops that lined it. Some ghost towns still have employees, after all. She collected rocks, played on bails of hay and even eyed hand-crafted miniature covered wagons. It's definitely a fascinating place, one I'd make another trip to see again. We grabbed some chow at the local restaurant, which served buffalo burgers and BBQ. The drinks even arrived in over-sized Mason jars. Our waitress told us that one of the staff lives on-site. Wonder where ... there wasn't really much in the way of a hotel. In fact, the place is also known for its camping. Now that takes some courage ... spending the night in the desert. In a tent. In a ghost town. Yes, we stayed in that pyramid -- aka the Luxor Hotel/Casino -- and yes, our room was slanted. How awesome is that?! I'd been practicing with CC a few days before we headed to Vegas: "Where are we going?" I'd ask. "Vegas!!!!!" she'd reply. Then I'd put my arms above my head, bringing my fingertips to a point, and ask her, "Where are we going to sleep?" "Pyramid!!!" she'd say. Actually it sounded more like "Pii-miid." "More pii-miid, Mommy!" Even though we've been to Las Vegas twice before with CC, I had a lot of excitement mixed with a little dread. I mean, that car ride can be looooong. Luckily, leaving on a Wednesday morning put us in Sin City a mere 4 1/2 hours later -- and that's including a little pit stop at the Primm complex just past the Nevada state line. Ian and I both wondered why people would drive all this way just to stop at Primm -- a smaller and less vibrant casino and outlet mall -- without even getting to Vegas. For us, it was an opportunity to stretch our legs and see what was in there, but I can't imagine trading the real thing for this. Does that make me a casino snob? Don't answer that. In any case, CC decided to have a full-on meltdown here after being the best toddler ever in the car. So maybe that affected my snobbery, er, judgment. What I wasn't prepared for was seeing how cool Old Vegas is, aka Fremont Street (left). This is the downtown area farther down from the Strip that existed long before Bugsy Siegel flashed his first Ace in town. It's now a pedestrian zone with a canopy that acts as a larger-than-life big screen with visuals that accompany loud, rocking music. One of its shops also offers deep-fried Twinkies, which I missed out on, unfortunately. I was a little upset, but then I comforted myself by saying I might have just been spared a heart attack. Ah, life's little trade-offs. The next day, after some general goofiness in the hotel room involving my child choosing to run around with adult underwear on her head, we took her to the Excalibur to see the Tournament of Kings live dinner show. CC and Ian loved the horses and the whole King Arthur aspect, but I think they especially loved eating chicken sans silverware and shouting "Huzzah!" while beating the table at every opportunity. On the way back to the Luxor, which is just a walkway away from the Excalibur, CC took off at full speed, something she is often wont to do. Unfortunately, this time, she took a tumble and landed right on her face. In the process, she had bitten her lip, which made everything look even worse. I felt around to make sure every tooth was connected and not loose ... and told her she was never allowed to run again. Period. She broke my new (obviously lenient) rule moments later. But seriously, seeing your child bleed is probably one of the most frightening things imaginable. And this is yet another instance of me wanting to secure her in bubble wrap for the rest of her life. Forget those high school bullies. Our final day in Vegas was a short one. But we packed a lot in. First, we ventured over to The Venetian for some ice cream and window shopping. The rest of the day included driving off from the gas station with the pump still in the car, as well as missing a mysterious turnoff for the abandoned water park off of Interstate 15. We did, however, make it to a ghost town. But more on that later. The fam and I are blazing a trail for Las Vegas today for some much-needed vacay. So while I won't be blogging over the next few days, I will be tweeting the fun stuff. You can check out my Twitter page here, or just check in on the red bubble above for the latest Sin City tweets. This worked really well when I tweeted the Oscars, so I wanted to bring back the bubble. 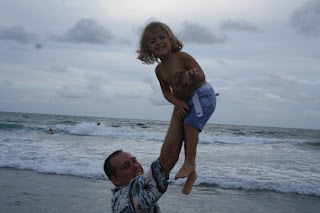 In the meantime, I thought I'd share some fun road-trip tips from the kid-friendly people over at PBSParents.org. Since the drive from here to Vegas is about 5 hours, it's always nice to have an entertainment plan handy for the 2-year-old. Take turns playing games with your child: Find something inside or outside the car, and have your children guess what you see by giving hints. Invite your child to be an "alphabet detective" by finding all the letters around her. Players might find an "A" in a road sign and a "B" on a license plate and more. Use car time to talk to your child about everyday activities and events, whether it's how leaves change color in the fall or what makes a great friend. Would love to hear your road-trip tips, too! I'm always up for new ways to entertain the toddler. 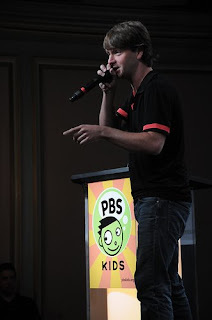 When I posted back in April about an episode of new tyke show "Sid the Science Kid" from The Jim Henson Company airing on PBS Kids, I was impressed by what the concept had to offer -- a curious child, supportive adults to nurture his curiosity and the genuine fun he had while learning. That, and CC went crazy for it. Now that a pair of "Sid" DVDs have hit shelves today -- "The Bug Club" and "Change Happens" -- and I've seen more of what this clever kid has to offer, I'm even more impressed, particularly because I've seen my child's attention span and inquisitiveness grow since we first laid eyes on "The Dirt on Dirt" a few months back. If you haven't caught the series, Sid is a school-age kid who wants to know "everything about everything" -- and doesn't hesitate to ask. He asks his parents, his grandma, his friends and his teacher, Susie. Everything that adults tend to take for granted -- how living things grow ("My Shrinking Shoes"); why objects decay ("My Mushy Banana"); and why leaves are important to plant life ("Don't Forget the Leaves") -- are front and center in this little guy's world. And lucky for him and his audience, there's always an answer to the ubiquitous "Why?" The format for each episode doesn't change from topic to topic. Sid asks the question, like most kids, on his own; then asks his parents, who help him out; he surveys his peeps; then investigates during class. Repetition, I've found, is incredibly important for kids, especially ones CC's age. And in "Sid's" case, this provides some sort of template, which allows children to get a handle on what might be too academic or overwhelming. Watching CC engage in the show by asking her own questions and pointing to various on-screen elements -- heck, just sitting through the whole episode, which she couldn't do in April -- reinforces for me how certain types of programming can be a worthwhile learning experience. And after we watched "Don't Forget the Leaves," we spent lots of time drawing different kinds and colors of that famous plant appendage. I have to say, I love it when you can turn a show into some kind of activity. The best part is that as CC grows older, she'll grasp even more while watching Sid and the gang. That's something else I appreciate -- a learning experience that doesn't have an impending expiration date. Not only that, but the DVDs have lots of extras, even episodes from other tyke shows. Raising a daughter who learned to say "beach" before she could say "burger," I'm always happy to reinforce her learning on all things aquatic. That's why when I received a copy of the "Dive Olly Dive!" DVD "Ship Shape Sub" -- a title I'd never heard of before -- I was eager to see what CC and I had been missing. And, for the most part, the episodes made a splash. The animated series, which airs in the U.S. on PBS Sprout, chronicles the underwater adventures of Olly, a submarine in training; his BFF Beth, another young sub; as well as frenemy Skid, who all report to the likable Aussie boss Diver Doug. While Olly (the overeager one), Beth (the practical one) and Skid (the transport vehicle who longs to be a sub, too) investigate oceanic life, they also engage in behavior that mirrors life on the playground. In the first of five short episodes, "Haunted Ship Prank," Skid dares Olly and Beth to spend the night on a supposedly haunted wreck -- a Diver Doug no-no. Once they take the dare, they start hearing mysterious noises all around them and are understandably terrified. Is it a ghost or the prankster himself? This is definitely a plausible scenario among kids -- albeit kids a little older than CC -- and the animation is absolutely fantastic. Incorporating underwater elements into the storyline, such as sonar and how cool it is for the young subs, is also an innovative touch. But because this was the first episode on a DVD of a show I'd never watched, I had some expectations and one key misunderstanding. First off, Diver Doug never appeared in this episode. (He doesn't get face time until a couple episodes into the DVD.) I wasn't sure if he ever appeared, but I was surprised that a key character was missing from the introductory segment. However, "Ship Shape Sub," which hits stores today, is the second DVD in the series. The first is "Dive Olly Dive! The Adventure Begins in the Sea," which was released earlier this year. That might explain why I thought Skid was the underwater equivalent of the class bully. "Haunted Ship Prank" gave me that impression, but he isn't really. He's actually the character who wants to be something else and overcompensates a bit. He is genuinely liked, despite his efforts to prove his superiority, and he genuinely likes his teammates. Glad that was cleared up in later episodes. All that said, CC loved every episode. We had to take breaks from watching, but she was attentive, engaged and entertained. She asked about lobsters, a seal (cleverly named Luseal) and kelp. There was lots of "What's that? What's that?," which is something I love to hear her say. While she couldn't really relate to the relationship issues -- the prank; the idea of disguising a weakness ("Navigation Consternation"); or the embarrassment of finding something out the hard way ("Don't Tell Beth") -- CC enjoyed the look, the sounds and the characters. I know, I know. As I wrote on Twitter, there's a child-services joke in there somewhere. 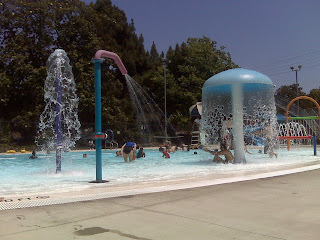 All inappropriate narcotics-related kidding aside, CC and I ventured over to the West Side and took a dip in this amazing pool, complete with splashy waterworks and even a twisty slide -- for 7 years and older, much to CC's dismay. CC had a great time despite being denied a slide ride. We must have walked under that drizzling mushroom a dozen times. And each time, she let out the loudest squeal of delight. What can I say, the baby loves getting soaked. What's especially great about this pool is that it's very much like the beach -- without all those scary waves. You just ease into the water, which starts at only a couple of inches. So CC could at least have the illusion of minimal autonomy, instead of me holding her the entire time -- which is what I do in the still-too-deep shallow end of a regular pool. And since it's a public facility, our total cost of admission was $2 plus a quarter for a locker. Not too shabby. But after an hour of swimming, splashing and playing in and around fountains, it was definitely time for CC to have a nap. When I got her locked into her car seat, CC looked at me in all seriousness and said, "Ocean, please." The lights went down in the Viennese room at Pasadena's Langham Hotel, and on a large screen appeared the press-friendly face of President Barack Obama. This video is brought to you, he said, "by the number 40." Sesame Street is turning the big 4-0 this year, on Nov. 10 specifically, and PBS has decided to shake things up. Mid-life crisis? From what I could see at the Television Critics Association Press Tour event on Saturday, it just looks like they're unwilling to show their age. Miranda Barry, executive VP of content, and Dr. Rosemarie Truglio, VP of education and research (pictured above), chatted about the new format and style kids and parents will see on the upcoming 40th anniversary season of Sesame Street. When the show began in 1969, the big deal on TV was Rowan & Martin's Laugh-In. You know, the one with Goldie Hawn doing the Frug on a pedestal? 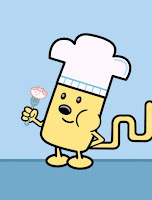 Well, in PBS' effort to reach kids through the most up-to-date medium (TV, at the time), they chose to replicate R&M's skit style -- catering to the short-attention-span-set. Children have since grown accustomed to longer forms, said Miranda and Rosemarie, so Sesame Street is going in that direction, too. It's also naming as host Murray Monster, who will guide kids through the hour-long program. A CGI element featuring muppet Abby Cadabby, called "Abby's Flying Fairy School." This is Sesame Street's first foray into CGI, and they seemed a little concerned about how it will be received. A parody of AMC drama "Mad Men." How hilarious is that?! When asked how they could parody such an adult show for children, they referred to an earlier parody they featured on "Sesame Street" called "Desperate Houseplants." Apparently, the show addressed how the plants weren't getting watered enough by their owner! Ahem. I'm totally blushing now. Celebrities such as Cameron Diaz, Kobe Bryant, Jason Mraz, Jimmy Fallon and siblings Jake and Maggie Gyllenhaal. 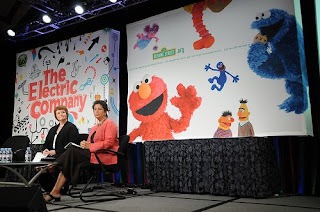 When I talked with Miranda Barry after the presentation, she emphasized what's really important about Sesame Street. "We want to reach kids with a message that supports learning," she said. Not only that, but being inclusive is also a big factor. "Can everybody in the audience see themselves?" she asked, referring to the different cultures and ethnicities that make up "the Street." "That was groundbreaking in the beginning." "The Electric Company" also has gotten something of a face lift. I haven't seen the show in years, but I remember thinking it was a little dated when I watched way back in the '80s. But it looks as if "Electric Company" is incorporating lots of hip-hop music and dance elements that reinforce learning -- vocabulary and phonics in particular. Actor Chris Sullivan, aka Shock, (right) kicked things off with a little beat-boxing of his own. He joined executive producer Karen Fowler and director of education and research Scott Cameron on stage to talk about the show. Beginning Sept. 7, "The Electric Company" will air Monday-Friday as opposed to weekly on PBS. Unlike "Sesame Street," "The Electric Company" is less parody and more a fusion of dance, music and learning. They've incorporated dance moves from Soulja Boy and Beyonce into segments about learning vocab. Shock will head out on a 20-city tour for a multimedia, interactive project that promotes literacy. The best part of the presentation for me was seeing the puppeteers and actors in person. I had my photo taken (will upload as soon as its available) with Sonia Manzano ("Sesame Street's" Maria); Leslie Carrara (Abby Cadabby); Eric Jacobson (Grover); and David Rudman (Cookie Monster), who told me he was literally Frank Oz's right-hand man on Cookie Monster when he arrived on "Sesame Street" just out of college in 1985. David eventually took over Cookie Monster and has brought him to life for the past 10 years. When I asked him if he's added any new flourishes to the muppet after he took over from Oz, he said not really. "He's such a recognizable, iconic character," he said. So no big changes ahead, I asked. No going on a diet for Cookie Monster? "No," David said, adding with a smile, "He won't be changing his name to Brussels Sprouts Monster anytime soon."